When I messaged Will online, it came out that I loved peanut butter cups. In person, over dinner, he handed me a brown paper bag and said, "I brought you a gift." I opened it. It was empty. I took a quick sniff. It smelled like brown paper bag. I said, "What am I supposed to be smelling?" He said, "Take a healthy sniff." I took another quick sniff. Brown paper bag for the win. He took it back and inhaled its rich, brown paper contents. He said, "I can still smell it." He put it away and said, "I ate like 10 peanut butter cups at lunch, breathed into this bag, and closed it up so it would smell like peanut butter cups for you." It struck me that even if the bag did smell like peanut butter cups, how was that even remotely a gift? Did he expect me to say, "Oh wow! A brown paper bag that smells like peanut-butter-cup breath! Let's do it right here on the table!" "What do you think?" he asked me with a stupid grin. I thought he was a moron, but I said, "Thanks." He ordered an entree with peanut sauce and when it came he asked me, "Now do you like anything with peanut butter or just peanut butter cups?" I joked, "Why? You going to breathe into the bag after eating your dinner?" He laughed, but he didn't deny it. He didn't breathe into the bag, but he leaned closer to me over the table as he ate, I guess hoping to infect me with his peanut-soaked exhalations. Once we were done with dinner, he went in for a kiss, but I deftly transformed it into a mere hug. Goodnight and goodbye. What he was hoping for. "Now do you like anything with peanut butter or just peanut butter cups?" Correct answer: why, anything at all!! OP sounds pretty ungrateful. We all know that the digestive odor of a food is exactly like getting the food itself. Which reminds me, I made you a lasagne. Advice to all the fellas out there: women are generally uninterested in smelling your bodily orders on the first date, even if it is scented like a favorite food. It may come as a surprise to you, but it's a really big turn-off! I like you OP. Thanks for the story. @Sparkina - it's simple. If he had actually put the candy in the bag, she would have just eaten it. OP was supposed to gasp and say "You... ate... PEANUT BUTTER???" 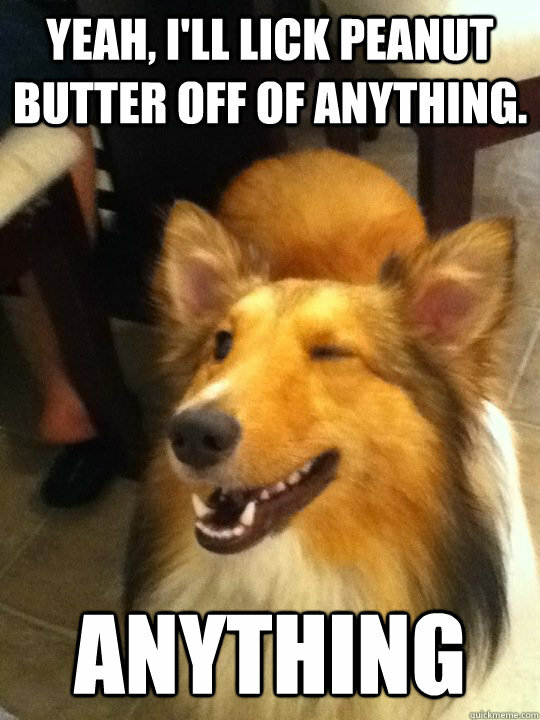 and then jump him to get that wonderful, lingering peanut butter smell directly from his mouth. Perhaps this guy has watched too many AXE body spray commercials or something. Now I'm certainly not implying that the OP is fat, but it sounds like Will's dating strategy is designed for "hunting big game," if you know what I mean.